Join us at our Summer Skincare Event! Learn from CT’s top aestheticians on how to keep your skin healthy and glowing this summer! Plus, you will save on MANY of our most popular skincare services as we bundle and discount them to be used by September 30, 2019! Do you worry about keeping your face well-nourished during summer’s punishing heat and humidity? We all want to enjoy the sun but we also need to be sure we stay on top of maintaining our skin’s moisture and vitality. Learn from Vickie and Lisa on how to keep sun’s damage to a minimum AND save money on our high quality products and services! Also save 20% off ALL NEOCUTIS products! All of these will make great Mother’s Day gifts! Light bites, gift bags and expert advice to help you glow this summer! Bring a friend! Save for Mother’s Day gift! Nip, Tuck or Tighten Event! Do you want to reduce fat around your abdomen, back, thighs, arms or love handles? With over 15 years experience each, Drs. Pan and Davila will talk about all surgical and nonsurgical options that are FDA-approved and highly recommended by hundreds of our previous patients. We will also have additional experts from Coolsculpting and Emsculpt on hand to answer any questions you have regarding some of your most stubborn fat areas. 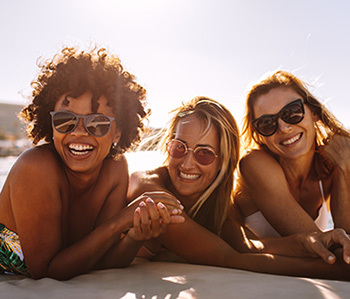 SAVE $650 off a package of 4 treatments for either Emsculpt® or Coolsculpting® if you book your procedure this night and leave a $500 deposit to secure special pricing. Short, private consults will also be available for personal questions. Dr. Pan and Dr. Davila’s are excited to introduce EMSCULPT, the new, completely non-invasive body sculpting device by BTL that builds muscle while burning fat. If you want help slimming down while achieving tone and definition on your abs or buttocks, EMSCULPT may be the solution for you! To introduce you to this revolutionary treatment, we are hosting an EMSCULPT Day! 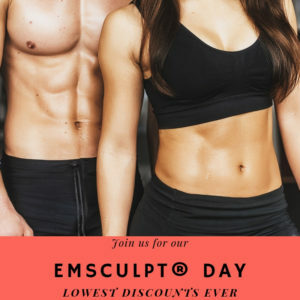 The event will be happening all day on Monday, January 28 at 10 Long Hill Rd, Guilford CT. We will be offering free consultations all day ($75 savings) and $750 off for those who book an EMSCULPT consultation and a future treatment! We’ve never offered discounts this low before and they will only be available the day of the event! Would you like your neckline to be more defined? 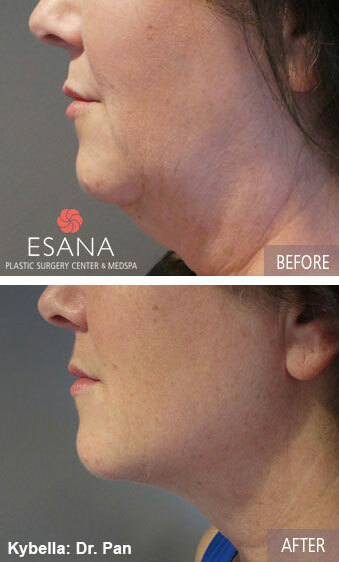 Learn about ways to tighten your neckline and reduce fat at Esana Med Spa’s Neck-Less Event Night on Thursday, November 29th from 5 – 6:30pm. Deborah Pan, MD, Javier Davila, MD, and Gabrielle Pino, PA-C will be available to consult with each attendee regarding treatment options to achieve a more defined and slimmer neck you always wanted! Kybella, Ultherapy and Cool Sculpting. Show off your beautiful neckline with a new necklace! Our favorite local Guilford Boutique, LULU’s, will be showcasing a selection of necklaces created by local jewelry designers that night. Enjoy refreshments and light pickings. Would you like younger-looking hands? Have they lost their volume? Receive a $200 gift the day of treatment: $100 Dysport gift card plus $100 gift bag! Ten patients who have a consult will receive half off the second hand with Restylane Lift, an FDA-approved treatment to add lost volume to your hands. Microneedling with PRP exclusively at Esana! You must be seen on this day in order to receive this discount. Supercharge your microneedling treatments with Platelet Rich Plasma! This advanced technology is the next generation of PRP facials, where your own “liquid gold” is then needled into the skin to further promote collagen production and healing. Both Vickie in New Haven and Lisa in Guilford will be seeing patients this day and offering this special discount. It will not be offered any other time! Please call either office to schedule your appointment! Our aestheticians look forward to helping your skin receive the best stimulation possible to lift and tone evenly and help you look years younger!